Hello, Gorgeous! : 1 skirt, 2 looks! Do you ever have those days when you wake up and stare at your closet (for what seems like forever), and still come out without a descent thing to wear? So, what's a girl to do? Pick out an old reliable, and switch it up a little! -Instead of tucking a shirt in, wear a similar shirt and leave it untucked. -Stick to a color family that you know works, and switch up the pieces. -Wear a necklace over the shirt, instead of under. There are so many ways to wear the same pieces differently. Just have fun and don't be afraid to mix it up! Very cool look, I love your style! I love these looks! They are so cute! Thanks for the tips! Love the striped sweater! Tucked in tops and pencil skirts are my go-to look for work. Love your polka dot shirt! Great looks. You seriously have the best fashion blog! You style simple pieces together and it comes out so elegant, I love it! I really like the idea of sticking to a colour family when one can't find something to wear! Love them both. Super classy. 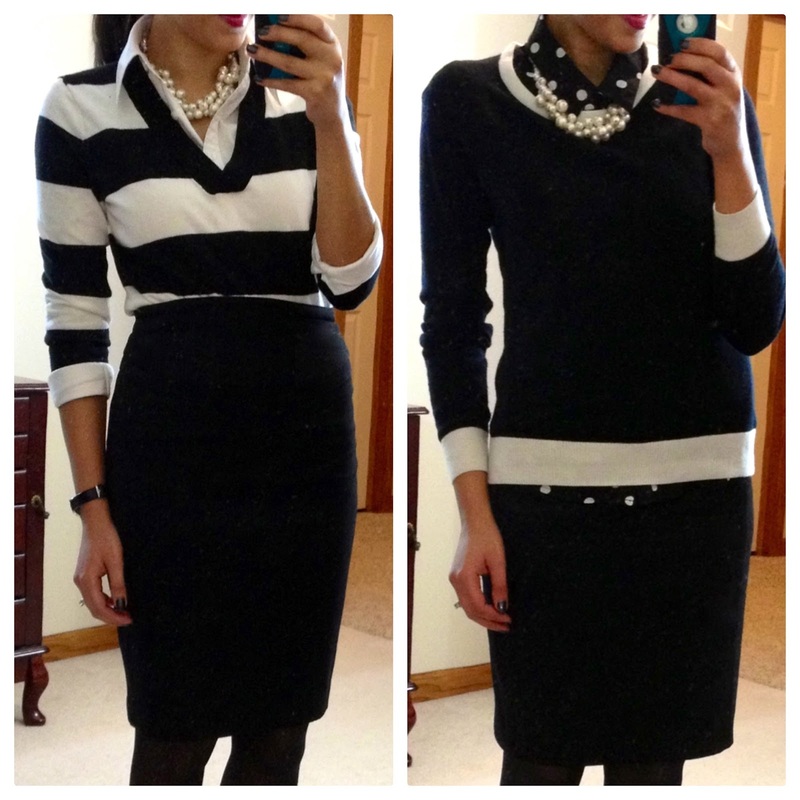 Fantastic black and white pairings! Hi Yasi - I love your blog and am in complete awe of your style! I'm inspired to recreate one of your outfits but I can't find the F21 pearl necklace anywhere! It's such a key item, is there anything similar you'd recommend? pre-spring with skirts & boots! life in pictures: the Persian new year! work wear & casual wear, lately! Stella & Dot Giveaway Winner!! 5 basic shoes & how to wear them.